Roberta Lindal’s start-up began with a ‘happily ever after’. 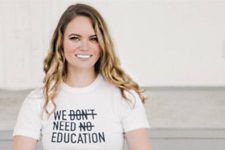 Lindal, BA’14, credits an early mentor for sparking her idea to create clothing that inspires girls to pursue their education, and help others who face incredible obstacles in their learning. “This amazing boss of mine used to tell her 5-year-old daughter fairy tales, but would change the ending from, ‘… and they both lived happily ever after’ to ‘… and they both went and got their engineering degrees,’” Lindal explained. With that as her focus, she started La Petite Écolière, a girlswear line without the ubiquitous princesses, fairies and unicorns. Instead, Lindal’s designs underscore what she asserts Pink Floyd got wrong – we do need education. According to the UN, an estimated 65 million girls are not in school. Lindal wants to do her part to change that, by donating proceeds from every purchase to Plan International. At the same time, she said she couldn’t ignore other statistics that affect her own country. Lindal “got the entrepreneurial bug” herself by working at NEXT Canada, a non-profit agency that fast tracks the development of Canada’s young innovators, and where she saw significantly fewer female applicants to the program. Her passion for cause-marketing started at an even earlier age. Working full-time at The Ontario Science Centre as a Development Associate by day, Lindal works on her business at night. For now, she funds the project on her own, thankful for parents who let her move back home in order to save enough money to launch her company, build her own website, and pay her graphic designer, a friend she met at Western. She makes it her goal to sketch one concept per day, “Just on a scratch pad, because you know, for every one good idea you have, you have ten that are terrible, or aren’t going to sell,” she laughed. She feels fortunate for the mentorship of Eli Brown, a former Western student and founder of Shine the Light On, a clothing line for men and women that ‘shines the light on’ mental health. Lindal’s shirts, sold through her website, are “imagined, designed and made in Canada” from organic cotton and bamboo.